A couple of years ago, Katie took second in Boston Magazine's Battle of the Burger Homegriller Competition, using a recipe we concocted for the old rotio/food (click for recipe). The guy who won was a former restaurant chef who was finishing his book on grilling (hardly an amateur or "homegriller" if you ask me). Since then, we've been trying to nail down our perfect burger that we both can call our favorite. We've been experimenting with the bun because, we believe, with most sandwiches, the vehicle for delivery can make or break the deal before you even get to what's inside. We've made some Buddy sourdough english muffins and hard rolls that taste great with a burger but we've been looking for something more traditional - crawl before we walk. 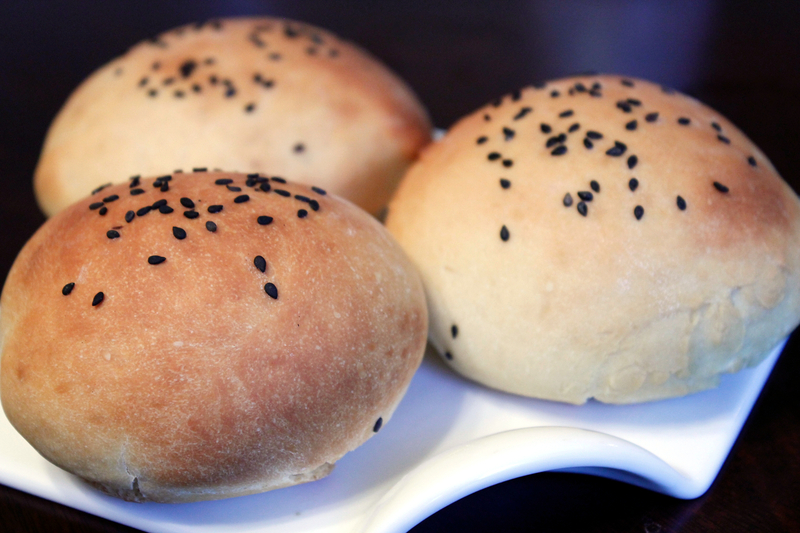 The traditional hamburger bun is soft yet sturdy, with enough give to absorb the juices of a perfect burger but enough spring to not crumble under the weight. This is our first shot at a Buddy sourdough hamburger bun and gets us one step closer to our ultimate burger. 1. Mix first 7 ingredients. 2. Slowly add flour, mixing constantly, until incorporated. Dough should not be sticky. Add more flour if necessary. 3. Knead for 15 minutes until smooth and elastic. 4. Cover with a damp towel and let rise until doubled (about 60 min). Tip: is your house cold? Heat a bowl of water in the microwave on high for two minutes. Remove the bowl and place covered dough in microwave, close door and allow it to rise in the warm humid environment. 5. If not using immediately, dough can be refrigerated up to two nights (covered). If using this technique, remove from fridge at least 90 minutes prior to next step. 6. Separate dough into 120g sections (about an eighth of total dough). Form into balls. Place onto parchment paper in deep, oven-safe pan, cover and let rise until about doubled. 7. Preheat oven to 350 F (at least 30 minutes if electric, 20 min if gas). 9. 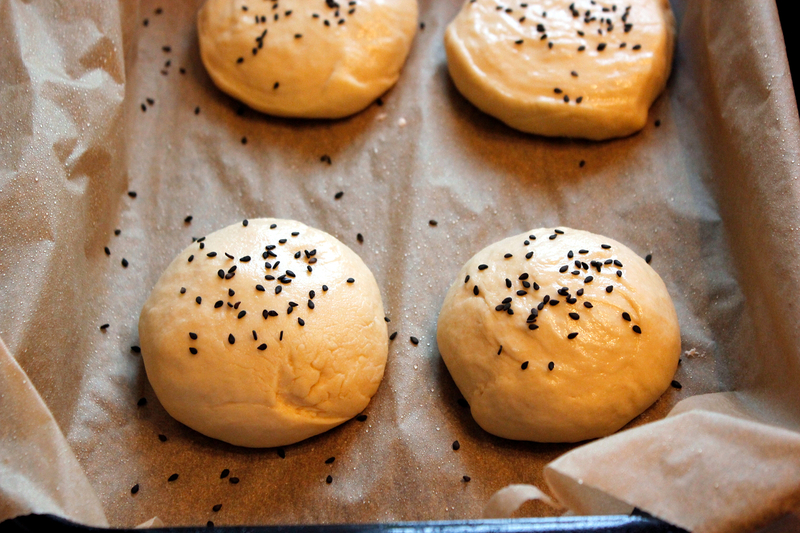 If adding seeds to the top of your buns, brush them with water and add the seeds. 10. Bake (in pan) for about 25 minutes or until light golden brown. 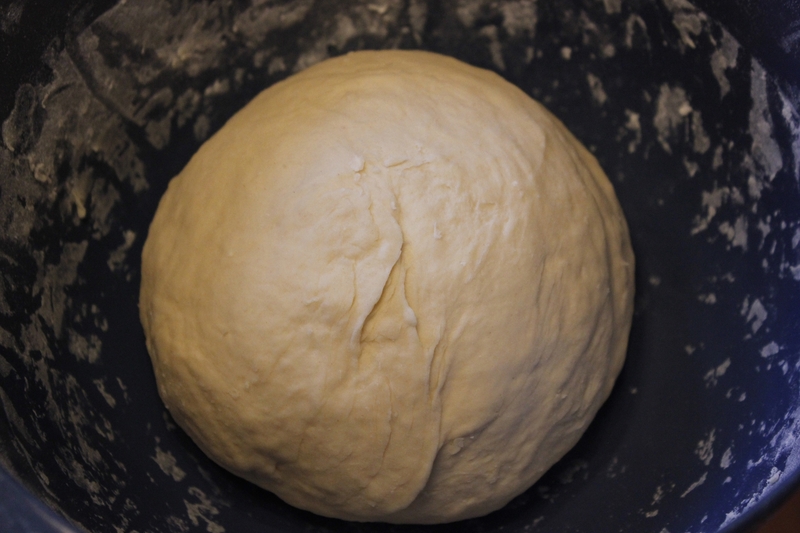 Sourdough ball, ready to rise. 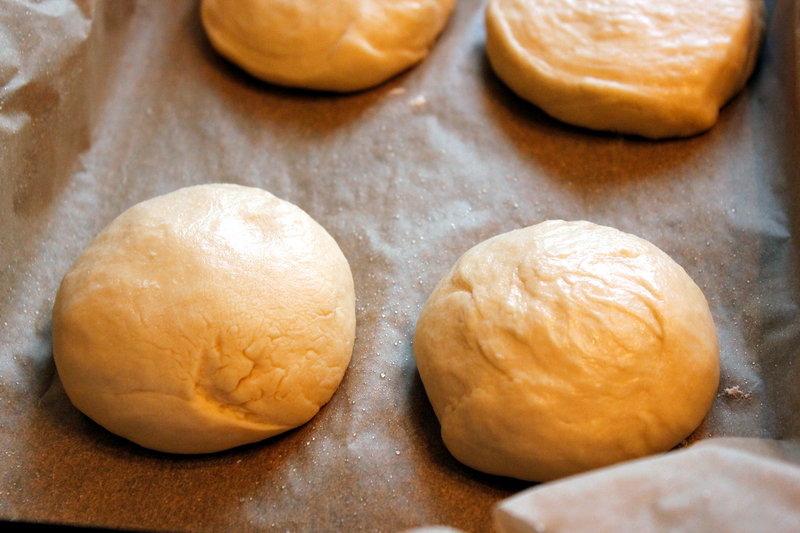 The buns shaped and risen - almost ready for the oven. Some black sesame seeds for a little extra nutty flavor. Final product, ready for a juicy, rare burger.